Rudy Giuliani just conceded Florida. He was sweating. The bright lights reflected off of his eye-glasses. This was in contrast to Giuliani’s campaign appearances where he would appear composed and wearing contact lenses. Now that Giuliani is on the verge of making his departure from the race public, it’s a good time to look at the odd campaign he ran. The main problem wasn’t merely his strategy — although his strategy was certainly wrong-headed. Remember Patrick Buchanan telling me if Giuliani was his strategist, he’d be “sleeping with the fishes.”His campaign, quite simply, was mystifying. 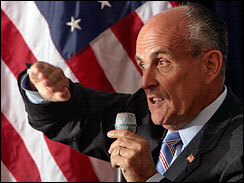 When I traveled with Giuliani in New Hampshire’s lake region during the summer, he seemed energized. Polls indicated he might develop some traction. He schmoozed with locals and spoke energetically at town meetings. He was on the rise when John McCain seemed dead. But his campaign never really bought into the importance of campaigning in the Granite State, a place with moderate Republicans and Independents with whom he should have been able to do well. By the time I went with Giuliani on a bus tour across the state’s southern tier, things had soured. The campaign laden with press staffers, whose job seemed to be to shoe reporters away from New York’s mayor, was highly managed and little time was permitted for real encounters with New Hampshire voters, a must in that state of retail politics. My sense of Giuliani, and it goes all the way back to his bizarre appearance with his wife and Barbara Walters, is that somehow Giuliani wasn’t fully invested in the race. Something was holding Giuliani back. As Giuliani’s campaign faltered, his advocates, such as former Massachusetts governor Paul Cellucci, argued that his campaign strategy was devised to win a front-loaded primary race. That may be the case. But, to me, it seemed to reflect a certain reluctance to pay the physical and emotional price necessary in running for president of the United States. Maybe he wasn’t ready for the constant questions of reporters. Perhaps he wasn’t ready to devote his life to it. It’s possible there was some internal issue we’ll learn about over time. I don’t know. But it is one of the great political mysteries of our time.